Attolight’s entire system is optimized to achieve superior CL performance without compromising the scanning electron microscope specifications to provide the highest performance in CL measurement. Attolight’s CL systems do not require any alignment. Attolight has developed the first Quantitative cathodo-luminescence system that allows for the comparison of spectra from different regions and samples to representative quantitative differences in your sample. Secondary electron and CL images of GaN on sapphire. The CL image show threading dislocation defects (TDD) in GaN. 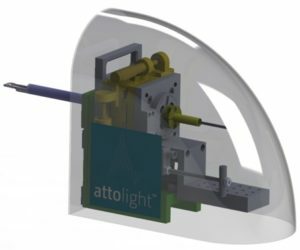 The Attolight system can be configured with a cryogenic nanopositioning stage that provides temperature control from 8-300K with 1 nm accuracy and pivot-point precision that allows you to define a pivot point and have the same rotated about that point. 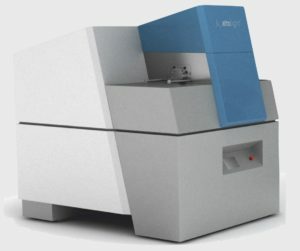 The Attolight system can easily be upgraded to include a range of external measurement systems and techniques including EDX, EBIC, micro-PL, and SEM-Raman spectroscopy. 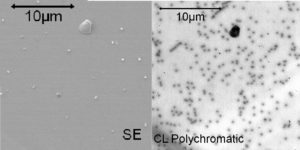 Secondary electron and CL images of a ZnO nanobelt. The CL image illustrates defects in the fine structure not observed in the SE image. Time-resolved CL images revealed a decrease in the exciton non-radiative lifetime in the dark area (with the lowest CL band edge emission). Time-resolved CL may be used for lifetime and charge carrier dynamic measurements. The electron optics within the Attolight system have been optimized for 10 ps pulsed operation – quick enough to elucidate manu common decay processes in semiconductor materials. For more information on Attolight, please contact us. You may also learn more by going to the Attolight web site.